I designed a stencil on my Sir Cuts A lot program and cut it out with my Cricut. I then made a 11"x26" pillowcase out of a painter's dropcloth. After those two steps, I sprayed the back of the stencil with spray adhesive and centered it on the front pillowcase piece. Next, I taped the bolts off, and painted that area with silver acrylic paint. Once the silver paint was dry, I took the tape off and painted the letters with lime green acrylic paint. This is what the front of the pillow looked like after the stencil was pulled off. I wanted to add some pizazz to the lettering, so I used my sewing machine and sewed on some stitches. Next, with right sides together, I sewed the back piece onto the front piece. Be sure to leave a hole so you can turn it right side out. Finally I stuffed it with stuffing and sewed the hole shut. 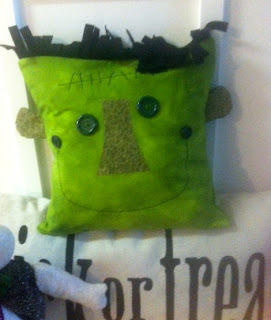 I also made a Frankenstein pillow with felt letters. All of the above pillows are for sale in my Etsy Shop. My Mom has also made some fantastic Halloween pillows. If you wonder where I get my creativity, it comes from my mother. 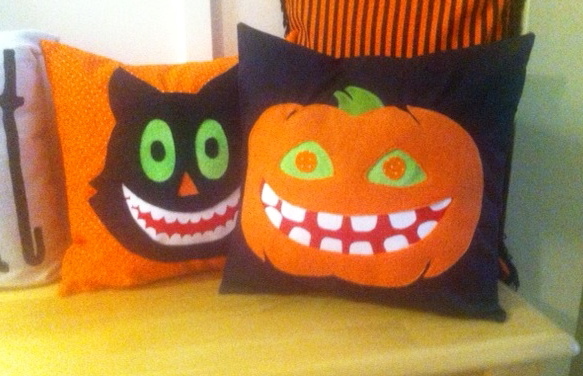 Isn't this Frank pillow the cutest! My mom is so talented. 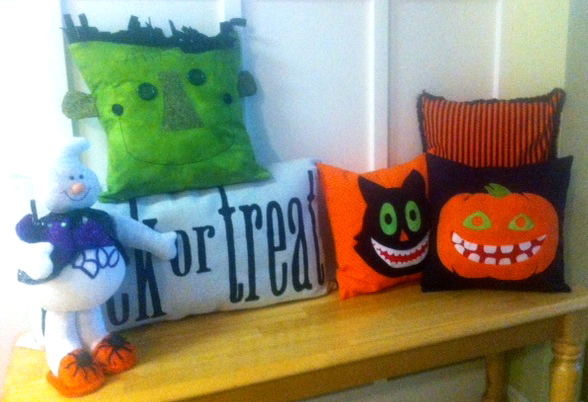 So many fun pillows! I really like the Frankenstein one with the stitches and bolts though!